Well, we had a few more days of rain….It is sloppy and cold in the tent, and COLD during the day. I know that it won’t last but brrr! The camp is a mudpit, and everyone is restless—we can’t get out to prospect or to quarry in this weather! Still, as miserable as it can be, there is something both healing and relaxing in falling asleep to rain on my tent wall. We had one town day, where we went to take care of some business that we needed to do but have put off to catch the weather when we can. We went to Gary and Barb’s to pick up some packages that were sent to us, bought groceries to feed the crews, and went to look at some topo maps at the BLM. A productive day, but not ideal. Still, weather is supposed to break a little so the plan is to go out and open an old quarry that was still producing—we just didn’t have any other places to put the bone. It is perfect for one of my student’s projects, and so when permits come through, we will take back the 40 foot wall to get at some pristine, untouched bone. In the meantime tho we can quarry down 1.5 meters, and things look promising. Lots of beautiful bone, including a spectacular braincase! It was cold in the morning but Jack (Horner, MSU) showed up in camp to check on the crews, and so joined us for some prospecting. 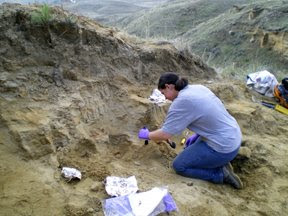 He was pretty excited to see evidence that some skull material was still preserved! 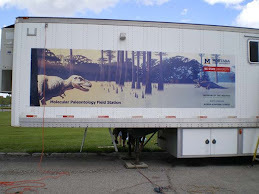 We are working three quarries in this area, all of which are producing bone that seems to be appropriate for what I hope to do this summer, and which will make our mobile lab very important. 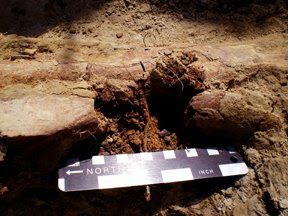 The crew uncovered some beautiful bones in one of the quarries, including this very nice hadrosaur femur. 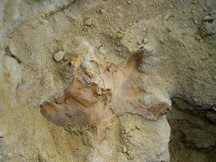 Hadrosaur braincase, with delicate bony ‘arms’ reaching up out of the sand. Jack and I, examining the work of our students. This is the fun part! It is a nice sample, and so I decide to do what makes most dinosaur loves turn pale….I believe that in order to better understand these critters, it sometimes requires that we destroy part of the samples. So after taking lots of pictures, careful measurements, and other documentation, I whack into it with my rock hammer. 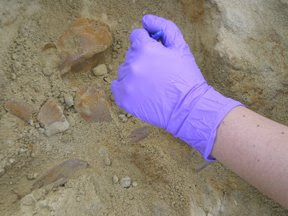 I took samples of the sediment too, as a control if we find biomolecules or tissues, but it is really clear that the bone is exceptionally well preserved. I collected bone wearing these beautiful purple gloves, and wrapped it tightly in tinfoil to keep light out (UV damages molecules) and then placed it into a jar with silica gel crystals. That will draw out all moisture, and prevent any damage, until we can get it to the lab for analyses. The bone will then be jacketed, and we will sample it again periodically to track degradation. 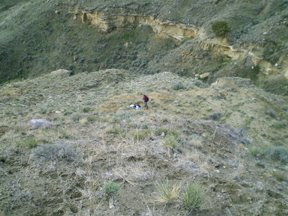 Next, we went to check out the quarry where my student Liz will be collecting data for her dissertation. She and her crew have a job ahead of them, as they will be cutting into a 40 foot cliff, taking it down to the bone layer. Looking down from the top to the bone layer. All of this will have to be removed to get at our study specimens! The Museum had previously worked this quarry, which has bones from many different hadrosaurs. It represents a flooding event, probably when, like caribou, these herds of dinosaurs attempted to cross at high water, and drowned. 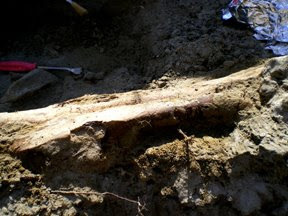 Some of the bones came to rest against a gigantic tree trunk, which ran through the middle of the quarry. Although the majority of the tree was collected years ago, there remains enough of it still in the sediments to make another good control for Liz’s dissertation. So, Liz removes what we can get to without a change in permits, and, wearing gloves, cleans and collects the bone for her study. The sand is like butter. 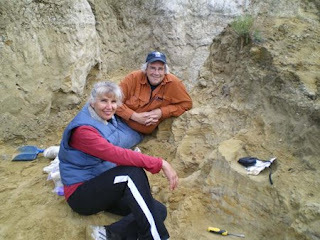 This type of deposit is every paleontologist's dream, because the material is so easy to prepare. As I mentioned, the bone is beautiful, undistorted, and easy to work with. So even though they must remove almost 40 feet of overburden, it will clearly be worth it in the end.